So I want to find out about changes to the X38. 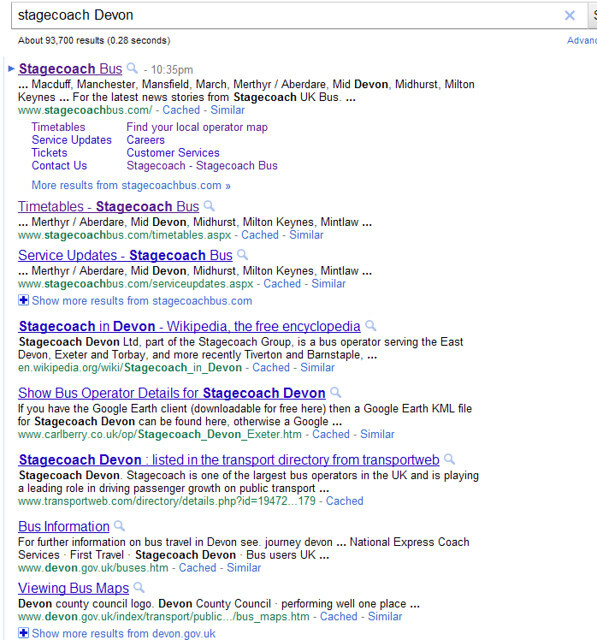 I know the service is provided by Stagecoach Devon so I do a Google search. So I click the first link as its usually the one that fits best. I then got a shock as the first time I did this I arrived at a page for Stagecoach East Scotland! 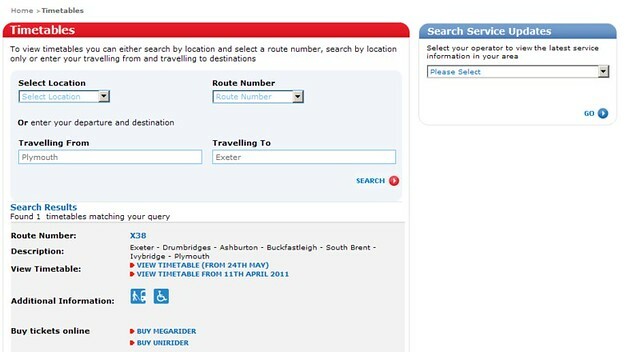 When I tried to replicate this for this article it did go straight to Stagecoach South West so clearly the site remembers your settings but it does cause confusion to begin with. You can see the two links for the timetables found. One gives View Timetable (from 24 May) and the other View Timetable from 11th April 2011. What is not immediately clear is that the current timetable is the first link. 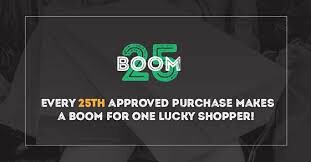 It would help if the date said 24 May 2010 to make it clearer. 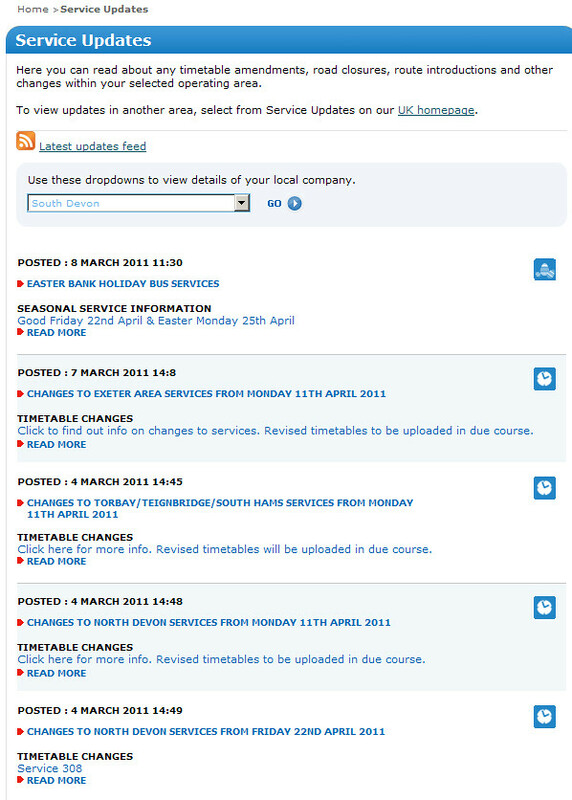 You can then select the link and go straight to a timetable (PDF) which just gives the basic timetable as from May 2011. There is no indication of what the changes are to the times. OK so maybe that's not a big issue on a timetable but it would be nice to see an explanation of what the changes are. 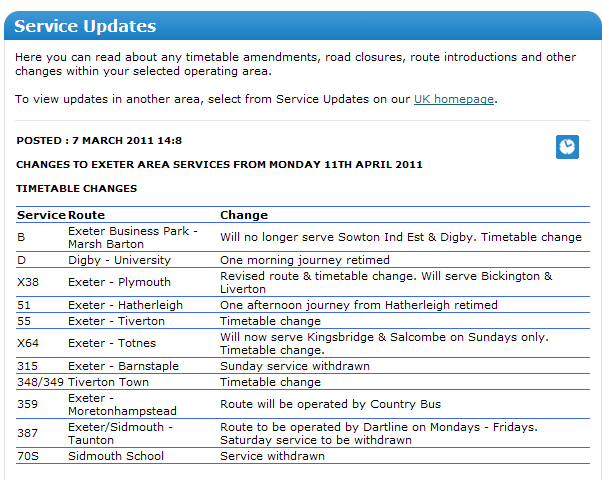 I guess we are spoilt in Plymouth as Citybus have are very good at highlighting changes on their timetables. That said the timetable itself is very clear and easy to use. You get the whole timetable in one easy go. Again you get a drop down list of all the areas served. So try Exeter - not listed. 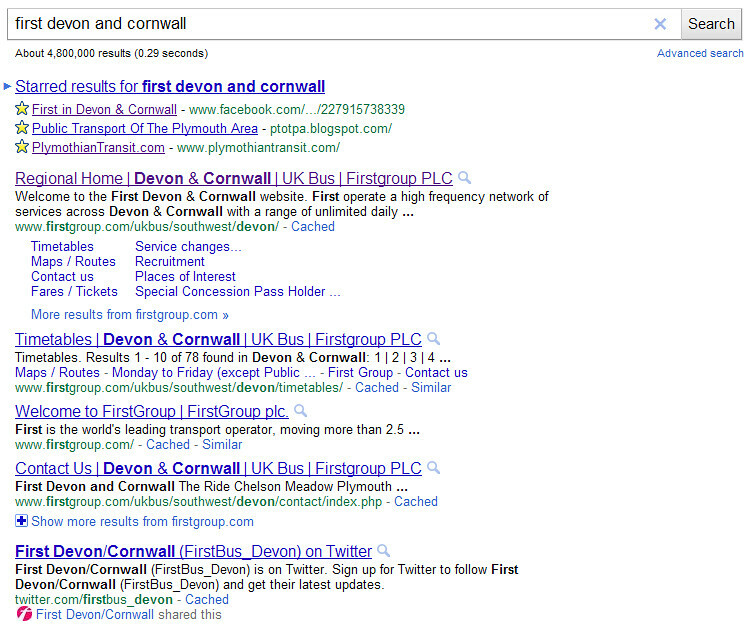 Try Plymouth - not listed. Try Devon - not listed. You then search through the drop down and see the not so useful "South West" This is just annoying! At least you then get a fairly clean functional listing of the recent updates. Mmm. Very basic info with no detail. Not exactly friendly is it? 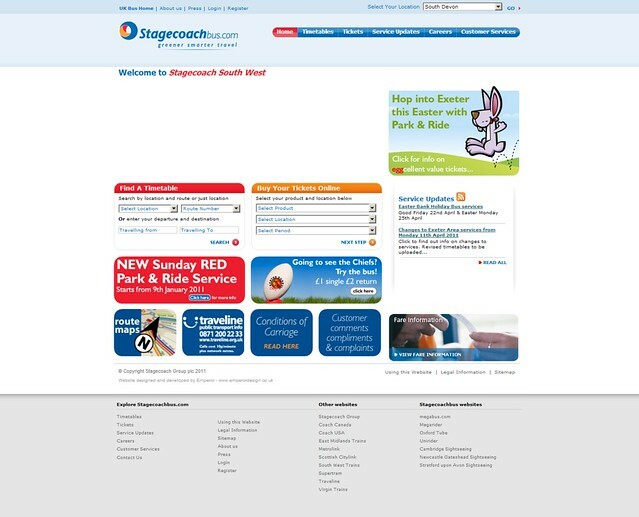 Well its a lot more cluttered than the Stagecoach South West page but its clear and easy to use and you can find pretty much anything you want from this page. You can either scroll through the 8 pages to get to the timetable or take a guess at which page its likely to be on. Not brilliant and made slightly more difficult to guess as where would you list the X80 - many operators list X services after the main numbers where as here FDC ignore the X and place it as if it was service 80. 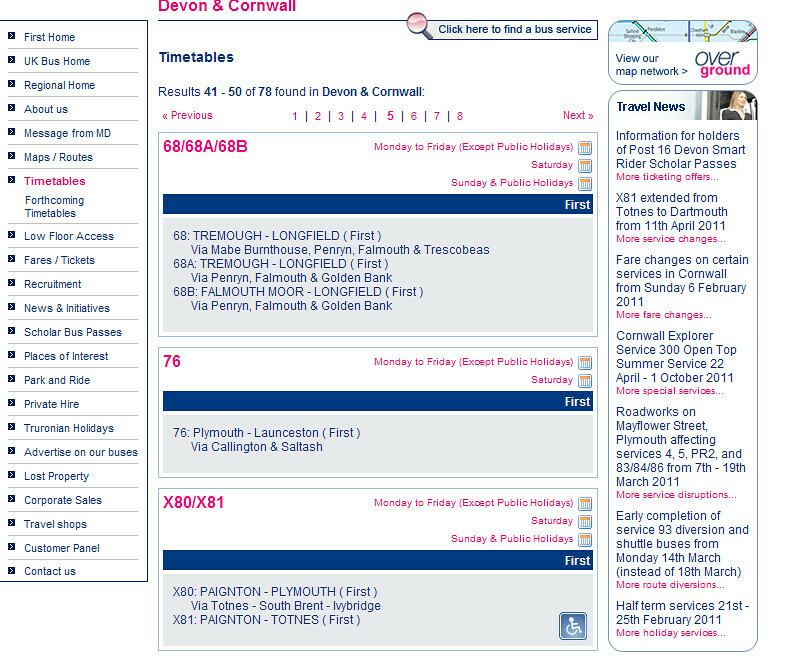 It is also nice and clear as to what is the current timetable with all future timetables available on a separate link. This is useful. Sadly this is where First looses a few points. With Stagecoach you get the full timetable in one go. Monday to Saturday and Sunday all on one page. There is no way of getting a nice neat timetable like this from First. With a complicated timetable like the X80 it involves a lot of scrolling down through the times. You can link to the PDF which at least gives the fuller timetable to the page with less scrolling but you still have to print out separate pages for Saturdays and Sundays. There is a handy link to a large print version (PDF) but for a large timetable like the X80 it is less than ideal as it looses decent page formatting so could get difficult to use. Smaller routes would probably be ok. There is also the Personalise link on the page but I have never managed to get anything from this so not sure what that is! So lets see how the changes to the X80 are being dealt with by First. Clicking the link to service changes you can then see the X81 listed. This is a lot better. First try a lot harder to explain the changes and sell the service. They are just as good as explaining why services are being cut back (even if you might not always believe their reasons, they do explain themselves). Its funny. If you compare Stagecoach and First nationally most people would say that First are the more centrally controlled corporate image led service. Stagecoach have lots of localised route branded initiatives whereas First seem to have a lot less (although in Plymouth we do quite well). However looking at the web sites it gives the complete opposite suggestion as the Stagecoach site is a lot more clinical (and possibly efficient) and therefore comes across as a lot less friendly. First appear much more friendly even down to the (not so) local MD giving a personal welcome. If they could just tidy up their timetables a bit it would be even better. 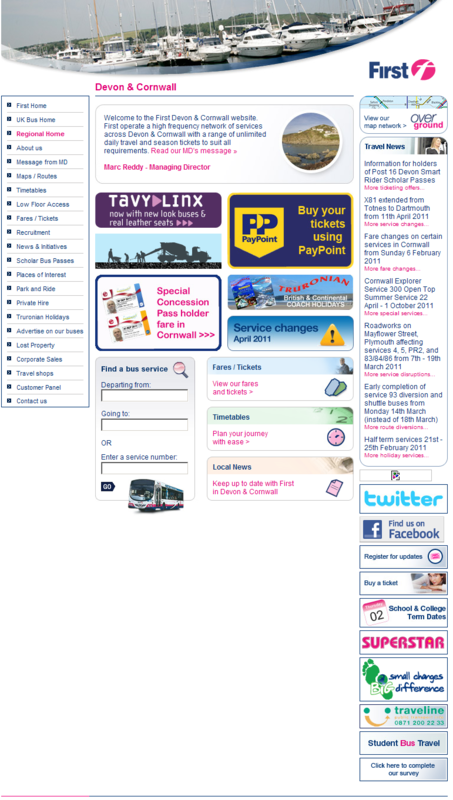 You do realise on the First website, that once on the timetable page, on the top right the is a search for a timetable bar. Click it and it drops down to give a to, from, or route number option. Put in X80 and bingo!